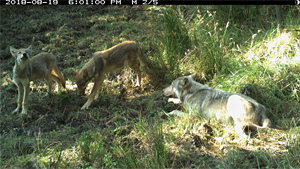 August 29th, Oregon: The Oregon Department of Fish and Wildlife says that new wolf pups mark the first known wolf reproduction in the northern part of the Cascade Mountains since wolves returned to the state in the 2000s. 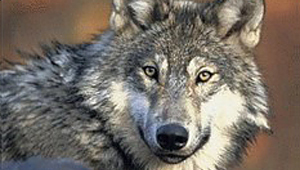 Wolves are a protected species in western Oregon. August 28th, California: A new show which follows the adventures of Navy Veteran Matthew Simmons, co-founder of the Lockwood Animal Rescue Center in California debuts this Saturday at 8:00 p.m. Mountain Daylight Time on Animal Planet. The premise of the show is to improve the lives of military veterans by enlisting their help rescuing endangered wolves. August 28th, Arizona: The latest studies show that Mexican wolf dispersal outside the species’ historical range, before it is recovered, would be detrimental to preserving the wolf’s unique characteristics. 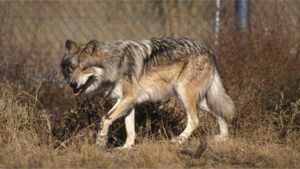 Hybridizing with wolves originally from Canada, not only threatens the unique characteristics of the Mexican wolf, but would also undo decades of success returning Mexican wolves to the Southwest. August 28th, Oregon: A northeast Oregon cattle rancher was reissued a permit to shoot one wolf on a forested grazing allotment where four calves have been killed or injured since June. The incident further underscores the continuing debate between ranchers and conservationists about how best to manage wolves in Oregon. August 22nd, California: Under threat of a lawsuit by animal protection groups, Siskiyou County in California, announced last Thursday that it would terminate its contract with the U.S. Department of Agriculture’s Wildlife Services. The USDA is being described as a rogue agency that still lives by the outdated slogan, “The only good predator is a dead predator." August 22nd, Washington: Kelly Susewind, the new Washington Department of Fish and Wildlife director, announced the wildlife department would kill wolves in the Togo pack for repeatedly preying on cattle. Two out-of-state animals rights groups immediately filed an emergency petition in protest, prompting a judge to set a temporary restraining order to prevent any action. August 20th, New Jersey: The Democrat governor, Phil Murphy, signed an executive order on Monday banning bear hunting on all state lands during the upcoming 2018 season in October and December. 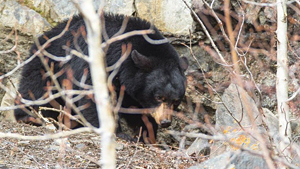 New Jersey has held a bear hunt each fall and winter since 2010 under regulations set by the New Jersey Fish and Game Council, an independent body of mostly sportsmen and farmers that is responsible for setting the state’s hunting regulations. August 17th, Washington: Washington wildlife managers have canceled a plan to withhold the exact locations of radio-collared wolves from ranchers. For now, Fish and Wildlife shares collar data with ranchers, who agree to keep the information confidential. However, the department also noted that GPS coordinates could be misused to track wolves to their dens in the spring where pups are later stashed for the summer. August 16th, Washington: The Washington Department of Fish and Wildlife is gathering more information about the Togo wolf pack, which is suspected of attacking five head of cattle in the northeast corner of Washington. The state's policy allows for killing wolves, if they prey on livestock three times in a 30-day period or four times in a 10-month period. August 14th, California: The Whiskeytown bear, whose paws were severely burned in the Carr Fire, is liking the comfort of a hammock that's hanging in a covered holding facility of the California Department of Fish and Wildlife. 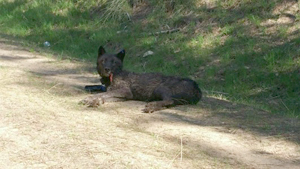 The plan is to eventually release the Carr Fire bear as close as possible to where she was found. 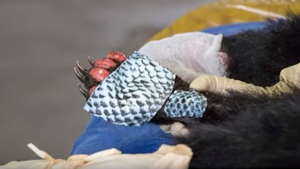 August 12th, California: A black bear, that's paws were burned in the deadly Carr Fire, has received an experimental kind of treatment involving fish skin. The animal is the third burned bear to receive this type of fish skin treatment, according to Fish and Wildlife, which noted that because the fish skins are sterilized, the bears don't recognize them as food. ALBUQUERQUE SUMMIT TO ADDRESS CRISIS OF STAT WILDLIFE MANAGEMENT IN U.S.
August 12th, New Mexico: Wildlife For All is a response to a host of problems facing wildlife conservation at the state level in many states, including: politically-appointed wildlife commissions that are not responsive to the broad public interest in wildlife. The event is organized by the Southwest Environmental Center and the Western Wildlife Conservancy. It will take place August 14, 2018 at the National Hispanic Cultural Center, 1701 4th Street SW, Albuquerque, NM. August 8th, Alaska: Andrew Renner, 41, and Owen Renner, 18, are accused of illegally shooting a sow black bear and her two newborn cubs in a den, then trying to cover up their actions without realizing a game camera was running the whole time. Charges were filed Monday in Anchorage District Court. August 8th, Washington: Two new wolf packs, named the Nason Pack and the Frosty Pack, have been confirmed on the Colville Indian Reservation in the State of Washington. The confirmation of the two new packs brings the total number of wolf packs on the reservation to five. August 2nd: A lawsuit filed by advocacy groups in a U.S. District Court in New York alleges that the International Wildlife Conservation Council is made up of “hunting enthusiasts” and “politically-connected donors” who are likely to craft favorable policy for groups that profit from hunting “imperiled animals,” the complaint said.